Over the holidays, I was excited to go East to visit the family. Even more so, after pledging on Kickstarter, I was anxious to visit the new brewery in Easton, Pennsylvania: Two Rivers Brewing. The brewpub serves a New Orleans-inspired menu, with staples like Gumbo and Poutine. At the time of our visit, they hadn’t started brewing beer yet due to a re-planning of the brewery floor (full tanks are heavy!). They were, however, serving a lot of very local beers (within 30 miles), including a few from Weyerbacher, the other Easton brewery. Our party tried the gumbo (great!) and duck fat fries (better than great!) as appetizers. The ladies each ordered a seafood dish, while the guys ordered different sandwiches on the menu. All of the food was outstanding, and the brewery quickly became a favorite with our group. After our meal, I spoke with Troy Reynard, one of the owners, and told him how excited I was for them. I mentioned that all I wanted for Christmas from my entire family was the $500-level Kickstarter experience, which included a brew day with the head brewer. The head brewer is Wayne Milford, whose last job was a brewer at Dogfish Head Brewing. The brew day experience is a bit different because it includes a bit of creative freedom from yours truly, and I am excited for them to begin brewing and have the opportunity to take part. We finished off the evening with Troy giving me the additional Kickstarter rewards, which included a growler (which I lent to my brother-in-law), a pint glass, a nice t-shirt, and other assorted swag. We had a great time in the historic building-turned-brewery, and I look forward to visiting them every time I make it out to the East Coast. 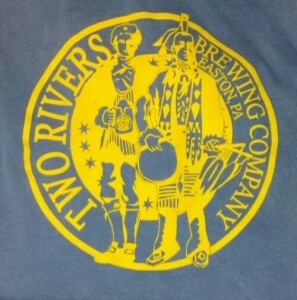 Have you had a chance to check out Two Rivers Brewing? What did you think?